More than one hundred years ago, biocatalysis was employed to do chemical transformations on non-natural man-made organic compounds, with the last 30 years seeing a substantial increase in the application of biocatalysis to produce fine chemicals, especially for the pharmaceutical industry. and both enantiomers of a racemic substrate may react at different rates. These are the major reasons why synthetic chemists have become interested in biocatalysis. 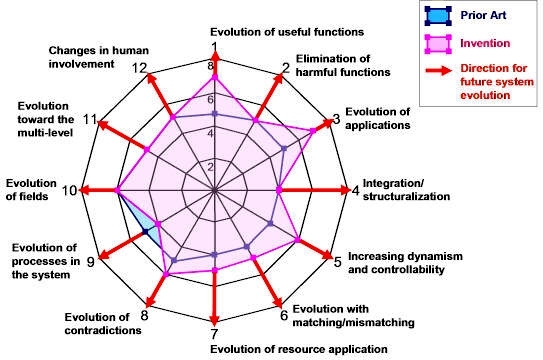 This interest in turn is mainly due to the need to synthesise enantiopure compounds as chiral building blocks for Pharmaceutical drugs and agrochemicals. Environmentally acceptable: being completely degraded in the environment. 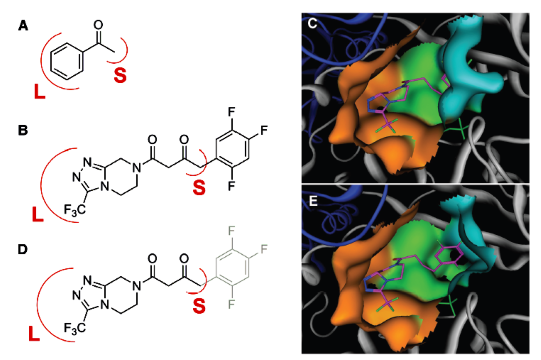 Minimizes side-reactions: The enzymes act under mild conditions, which minimizes problems of undesired side-reactions such as decomposition, isomerization, racemization and rearrangement, which often plague traditional methodology. Very high stability and re-usability: Immobilized enzymes demonstrate very high stability and re-usability and can be used to conduct reactions in continuous mode in microreactors. Key advances in advanced protein engineering, gene synthesis, sequence analysis, bioinformatics tools and computer modelling are at the base of tremendous progress in tailoring biocatalysts by protein engineering and design, and the ability to reorganize enzymes into new biosynthetic pathways. 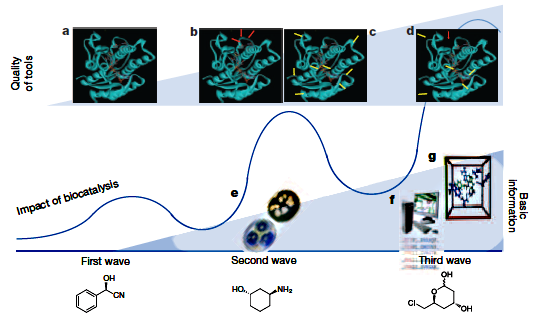 As a result of the advances made during the present wave of biocatalysis, remarkable new capabilities can now be engineered into enzymes. Ability to accept previously inert substrates. Change the nature of formed product. Can remain stable at 60C in solutions containing organic solvents. Can catalyse new non-natural reactions. Years work may now take only a few months. 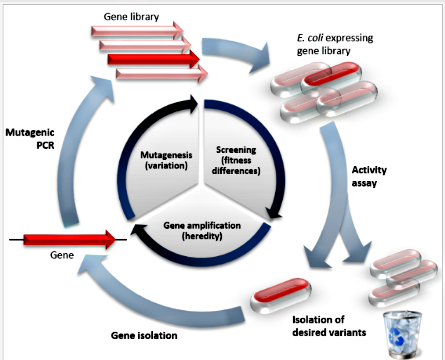 Multistep Biocatalysis or Metabolic Engineering? 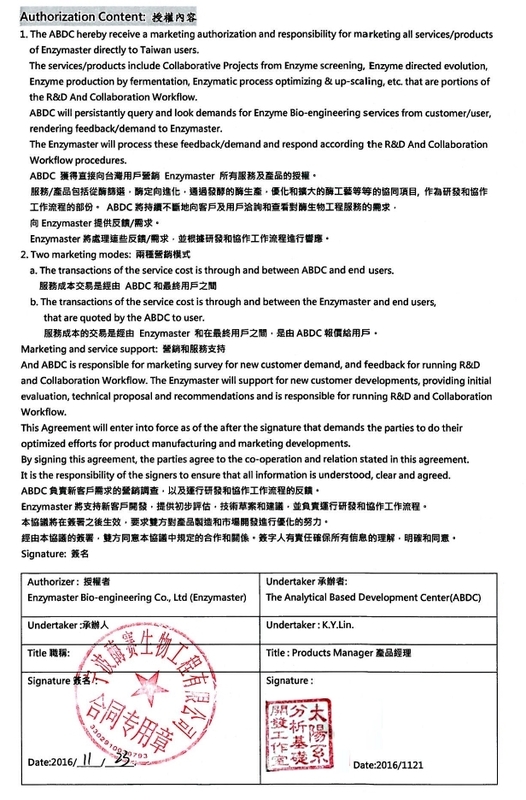 Our team partners, Enzymaster is a Chinese-multinational Joint company in the high-tech hubs in China's coastal areas. 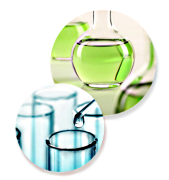 Having established close collaboration with numerous domestic companies, we specialised on providing Enzyme Catalysis Solutions to the pharmaceutical and fine chemical industries. Our collaborative working includes development of new Enzyme-Catalysis technology for various high value chiral intermediates, that also facilitate the transformation of the pharmaceutical and fine chemical manufacturing processes towards environmentally friendly and cost effective processes. The team members of Enzymaster have multinational origins, such as Germany, Singapore, Malaysia, Australia and China. We work closely as a multidisciplinary team by combining respective expertise in various scientific aspects. Joined Provivi in August 2015 as Sr VP to head the pharmaceutical division of the company. Dr. Rozzell has more than 25 years of experience in the biotechnology industry developing and building innovative companies. 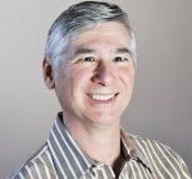 He is the inventor on 24 issued US patents and various pending patent applications. Prior to joining Provivi Dr. Rozzell created Sustainable Chemistry Solutions, Inc. as a consultancy and provider of information products to the enzyme industry. Previously, he was the Founder of BioCatalytics, Inc., a pioneering developer of enzymes and biocatalysis technology that was acquired by Codexis, Inc. in 2007. 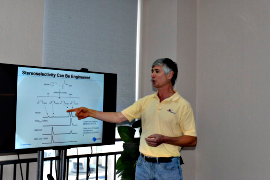 Dr. Rozzell received a PhD in Chemistry from Harvard University and a BS in Chemistry from the University of Virginia. Former Head of Institute of Biotechnology 2 Christian Wandrey was Professor of Biotechnology at the University of Bonn and head of the Institute of Biotechnology 2 at Forschungszentrum Jülich from ..... 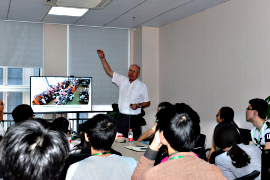 Professor Wandrey's special research interest was bioprocess development with main focuses in enzyme technology and fermentation technology. More than 330 scientific publications, about 100 patents and patent applications, and over 400 seminars present his scientific work. He is co-initiator of 4 start-up companies, co-editor of 2 books, and member of the editorial boards of various scientific journals. 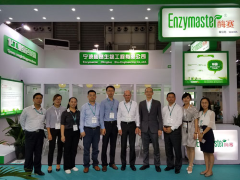 The platform technology of Enzymaster is on par with the state-of-the-art around the globe, with strong capability in molecular biology and high throughput biochemistry. 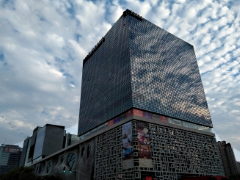 We have a strong focus on R&D helding ourselves to high professional conducts,and take pride to be able to independently create high value, novel Intellectual Property in-house. 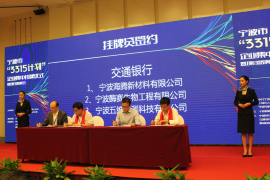 We are the first commercial entity in Chinese area that focuses on employment of enzyme directed evolution technology for commercial scale production, with reliable and capable R&D partnership for our collaborators. We have a wide variety of enzyme panel, such as ketoreductases, transaminases, hydrolases, and oxygenases. The collaborator shall provide the related material for the screening (such as substrate, product, analytical methods, and HPLC columns), and we shall screen for suitable starting enzyme using the optimized analytical methods, to ascertain the enzyme activity and selectivity. Based on the enzyme screening results, we shall evaluate the commercial viability of the enzyme and the processes, as well as the R&D investment needed, if any, to achieve commercial viability. With our core Enzyme Directed Evolution Platform technology, the properties of selected enzyme, such as activity, selectivity, and stability, can be improved. The evolution project will be staged into suitable phases, each with a specific target and milestones to achieve, with the ultimate aim of achieving commercial viability. We develop robust and highly productive fermentation processes for the commercial production of enzyme, and then transfer the process to the collaborator. With comprehensive consideration over the enzyme properties, we design and develop the commercially viable enzyme-catalyzed process and downstream process for large-scale chemical manufacturing. The technology is optimized for high productivity and robustment at large scale. Based on the technology transfer package, the process can be verified in the collaborator’s lab, pilot plant and finally the production plant. Directed evolution (DE) is a method used in protein engineering that mimics the process of natural selection to evolve proteins or nucleic acids toward a user-defined goal. 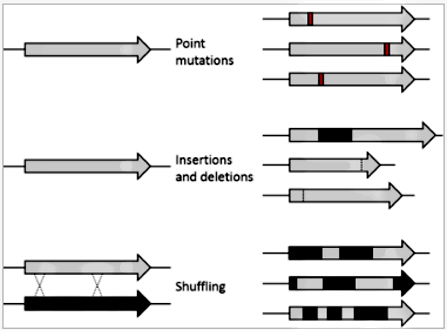 It consists of subjecting a gene to iterative rounds of mutagenesis (creating a library of variants), selection (expressing the variants and isolating members with the desired function), and amplification (generating a template for the next round). It can be performed in vivo (in living cells), or in vitro (free in solution or microdroplet). Directed evolution is used both for protein engineering as an alternative to rationally designing modified proteins, as well as studies of fundamental evolutionary principles in a controlled, laboratory environment. Directed evolution is analogous to climbing a hill on a 'fitness landscape' where elevation represents the desired property. 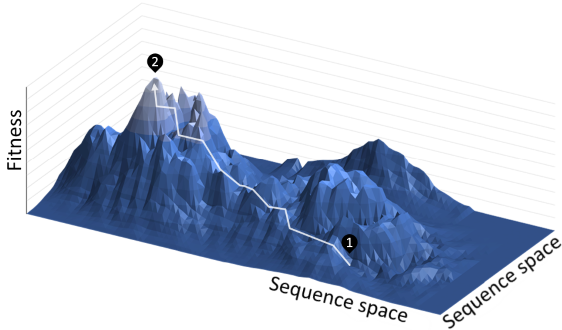 Each round of selection samples mutants on all sides of the starting template (1) and selects the mutant with the highest elevation, thereby climbing the hill. This is repeated until a local summit is reached (2). 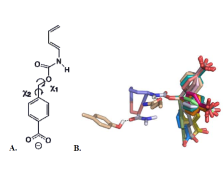 Here, we report an efficient biocatalytic process to replace a recently implemented rhodium-catalyzed asymmetric enamine hydrogenation for the large-scale manufacture of the antidiabetic compound sitagliptin. 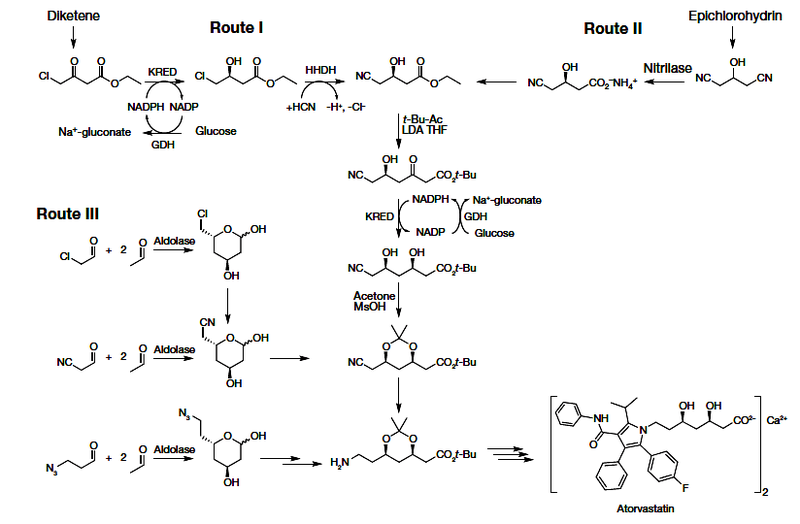 Starting from an enzyme that had the catalytic machinery to perform the desired chemistry but lacked any activity toward the prositagliptin ketone, we applied a substrate walking, modeling, and mutation approach to create a transaminase with marginal activity for the synthesis of the chiral amine; this variant was then further engineered via directed evolution for practical application in a manufacturing setting. The resultant biocatalysts showed broad applicability toward the synthesis of chiral amines that previously were accessible only via resolution. This work underscores the maturation of biocatalysis to enable efficient, economical, and environmentally benign processes for the manufacture of pharmaceuticals.